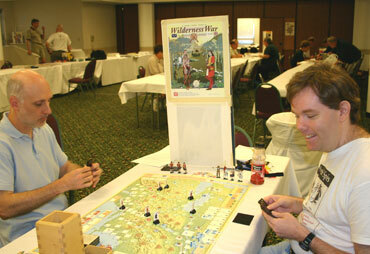 GM Keith Wixson (left) overcomes newcomer Stefan Mecay in the Final to win his first WBC Wilderness War title. Don Chappell (left) gets some well earned R&R with Doug Mercer in the swiss rounds before running his We the People tournament. GM and top seed Keith Wixson took advantage of the absence of defending champ and top rated Ron Fedin to become the fifth different champion in as many years of the tournament. Wixson was able to survive a close Round 4 loss to fellow semi-finalist Jonathan Miller by building up tiebreakers in wins over the second seed, 2004 Champ James ("The Master") Pei, and third seeded Bill Peeck in Rounds 2 and 3 respectively. Miller and 2006 PBeM Champ John Buse advanced to the semis with perfect 4-0 scores. Also advancing was Stefan Mecay, who had lost to Buse in Round 3 but had gained the necessary tiebreakers, barely besting George Young for the last spot, by defeating 2003 Champ Paul Gaberson in Round 4. Wixson defeated Buse in one semi-final match to advance to the Final against Mecay, who ended Miller's unbeated streak in the other semi. * The six 2005 laurelists were replaced by six completely different laurelists this year, underscoring the wide open nature of the tournament format. * There were fewer new players (four as compared to ten last year) which accounts in part for the 25% decline in attendance. But tne newcomers weren't babes in the woods, either. Stefan Mecay (at right) is an accomplished CDW player who was making his first trip to WBC. It won't be his last. 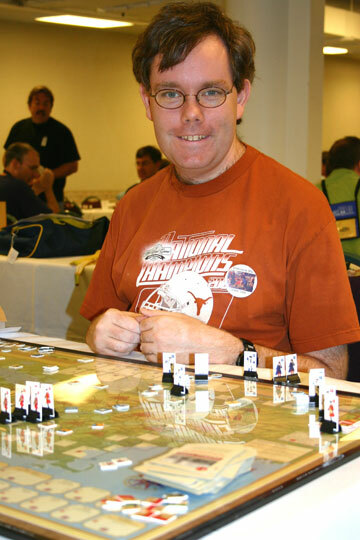 He rode it all the way to the Final, and also won the highly competitive new Twilight Struggle competition. Also a factor was the failure or inability of several regulars to participate. With new CDG titles joining the tournament ranks every year, the competition for players continues to grow. This may necessitate moving the event to a different time slot (possibly a pre-con). * Bill Edwards won the Biggest Upset Award, defeating The Master in Round 1 (as the Brits!). * The Most Improved Player Award went to Nathan Hill, who defeated Peeck and the fifth-seeded Gary Phillips. * The Top New Player Award went to Keith Butler, who won twice as the Brits. * The Sportsman's Award went to Greg Schmittgens, whose cheerful perseverance through four rounds in spite of a lack of success on the battlefield was in the true spirit of the convention. Greg's selfless willingness to help out the tournament (and his buttons!) made this award an easy choice. * The Brits finally made a good showing in the tournament, winning 22 of 46 contests! This was chieved in spite of the average bid to play the favored French actually declining to .93 VPs from 1.11 VPs last year. There were 21 bids of one VP to play the French and 11 bids of two VPs. * Of course, seven of the 22 British wins were compiled by two players, Miller and Wixson, so it remains to be seen if the years of French dominance are truly over. * Miller's four wins as the Brits in the preliminary rounds (all without bid VPs) was perhaps THE story of the tournament. His hyper-attritional "Sledgehammer" Strategy, while unsubtle, was truly innovative. * For the second year in a row the eventual champ had to defeat The Master to advance and the game came down to the final card and die roll. This year Wixson got lucky and was able to take Fort Duquesne on a 25% shot (after missing on a 66% shot at Fort Niagara earlier in the game which would have probably been decisive). * Prizes: The champ received a fleur-de-lis pattern pipehawk and the runner-up received a warhawk with a bear cut out in the blade. Various books and period 54mm toy soldiers were also awarded. Pre Game: Wixson and Mecay both bid two VPs to play the French. Mecay won the roll off. Early 57: Wixson decided to take advantage of his edge in experience and unusual card draw and force Mecay into a position with which he was probably unfamiliar. While Mecay sent Montcalm south to take Fort William Henry with little trouble, Wixson beefed up Johnson with Provincials and Rangers and then launched a two pronged "Campaign" up the Mohawk Valley, with Abercromby bringing up the bulk of the Regulars from New York. This offensive had several effects: (i) Montcalm was forced to abandon his operations in the Champlain Valley and backtrack to Cataraqui to protect Fort Niagara and the back door to Montreal, (ii) the French were forced to abandon and torch their stockade line in the West, which isolated Fort Duquesne and ate up OPS, (iii) as a result, French raiding was very light for the year, and (iv) the British were able to make an alliance with three tribes of the Iroquois Confederacy. Late 57: While there was heavy skirmishing between Indians in the area between Niagara and the Mohawk, Wixson was able to bring in a ton of reinforcements: (i) Wolfe and four Highlander battalions went to Halifax, (ii) Murray, three battalions of Regulars and a battalion of light infantry landed at Philadelphia, and (iii) Amherst and a battalion of light infantry appeared at Albany. With the appearance of Wolfe at Halifax, Mecay decided to abandon Louisbourg and evacuate the garrison to Quebec. The activity by the Iroquois in the wilderness further distracted the French from pursuing much raiding, who had no successful raids for the year. To add insult to injury, Wixson was able to sneak Roger's Rangers over the Green Mountains to successfully raid Ile aux Nois. Finally, with winter approaching Wixson abandoned the Mohawk Valley and pulled Abercromby back to Albany. The damage to the French position had been considerable, however. VPs at year's end were FR3. Early 58: The French raided heavily, particularly in the North. Murray set off from Philadelphia towards Ohio Forks, taking the northern approach route. Late 58: The French continued to raid heavily, eventually scoring three successes for two VPs. Wolfe landed at Louisbourg and took the lightly held fortress after a short siege. Murray continued to build a supply line through the wilderness toward the Forks. VPs at year's end were FR2. Early 59 (Wixson's "Turn of Miracles"): With the approach of Murray, Mecay decided to torch Fort Duquesne and abandon the Forks. Wixson drew "Courier Intercepted", played it early, hoping to plan a late turn push, and was successful on the roll. With Wolfe's army at Louisbourg threatening his rear, Mecay was forced to pull Montcalm back to Quebec. The imminent British card windfall also caused him to send a considerable force under Levis to protect Fort Niagara; the addition of the Louisbourg garrison, four battalions of Regulars from France and the lack of ANY battles between drilled troops to this point having allowed the French to field two large armies. The weak point in the French defense was Fort Carillon at Ticonderoga. With Amherst's army milling about Albany for over a year, Mecay had left it in place as the British had never refortified the northern end of the Hudson Carry. Wixson finally struck with four cards remaining in his hand (Mecay still had one). First he pushed Amherst all the way up to Fort Carillon and invested it before Mecay had a chance to torch it. Wixson held "Foul Weather" in his hand, so the risk of a relief attack by Montcalm was not that great. Mecay was fixated on Wolfe's threat to Quebec, however, so the attempt was not made. On his three unopposed card plays Wixson (i) opened up a supply line to Amherst by building a stockade at Hudson Carry North, (ii) played "Quiberon" and (iii) attempted to siege the fort, only to fail on a 83% chance of success! Late 59: The play of Quiberon flipped the turn order around and gave Wixson one more card play before Mecay could respond. On his second siege attempt on Fort Carillon he made the roll and took the lead. At this point the French position was basically wrecked. Without a VP lead Mecay could not afford to torch Fort St. Frederic at Crown Point. On top of that there were few options for gaining VPs. Wixson had fortified the Forks, so the chances of Levis retaking it were slim to none. Raiding seemed the only hope, but the British defenses were now complete and the French were unable to score any successful raids for the year. A French comeback was not to be; with a "Campaign" Wixson launched a successful Ranger raid under Johnson on the Shawnee home space at Logstown and pushed Amherst forward to Crown Point, Fort Carillon having been repaired to protect his rear. Mecay could no longer ignore his weak center and in desperation Montcalm was dispatched to save the day. In the only battle of the game involving drilled troops Amherst defeated Montcalm and destroyed his army. Mecay resigned with only a few cards left to play and with VPs at BR4. Moral: This game shows that there is more than one way to win as the Brits. The usual approach is attritional, but given the right circumstances a strategy based upon feint, maneuver and timely raiding can also be successful. Thanks to Paul Gaberson and Rob Winslow for being Assistant GMs. At WBC, all roads to CDW gold lead through the Master. Keith Wixson (left) meets the challenge by downing James Pei to move on to the championship. GM Wixson always spices up his events by providing very special period prizes. This year's painted miniature figurines supplemented weapon replicas. The tournament concluded after two years and a total of 124 games played with 50 players participating. Congratulations to the champ, John Buse, who made his Wilderness War tournament debut and beat out several veteran players to take first. Buse twice defeated 2004 WBC Champ James Pei, who is arguably the top overall CDG player in the world, to secure the crown. Very few people have a lifetime winning record against "The Master"! The French start off with "Ministerial Crisis", costing the Brits a card, but that allows Johnson to clear out Cataraqui. The French then raid heavily while the Brits build up in western PA. Montcalm and reinforcements arrive at the end of the turn. The Brits continue their build up in PA, while Montcalm masses his army at Montreal, causing the Brits to abandon Oswego. Both sides raid several times unsuccessfully. The French play "Diplomatic Revolution". VPs stand at FR2 at turn's end. Great hand for the Brits, who play "Pitt", the large "Highlanders", "Royal Americans" and a "Regulars" card. On top of that both Wolfe and Amherst appear! While the Brits play events, Montcalm marches down from Montreal to threaten Ft. Edward. A relief army under Wolfe boats up from New York but is beaten back in a close battle. Ft. Edward then falls to Montcalm. The British build up in PA continues, causing the French to torch Ft. Duquesne. Montcalm withdraws northward in the face of a huge British army under Wolfe advancing from Albany. The French are able to add many Indian allies, as the VPs are starting to mount. The French Ft. Duquesne garrison is wiped out in a desperation attack with winter approaching. The Brits start a build up at Halifax. The French get several successful late raids. VPs stand at FR6 at turn's end. The Brits continue their build up at Halifax, with Wolfe being shifted there, causing the French garrison at Louisbourg to abandon the fortress and sail for Quebec. The French raid heavily in the north. At turn's end Wolfe lands at Louisbourg. Louisbourg falls and the Forks is finally taken. The French are heavily reinforced with Indians and launch massive raids, but suffer heavy losses against the British "Blockhouses". The French main army at Ticonderoga suffers an outbreak of "Small Pox". VPs stand at FR4 at turn's end. The Brits begin to advance on Ft. Niagara from the Forks while also reinforcing Wolfe at Louisbourg, threatening Quebec. Montcalm's army suffers a second outbreak of "Small Pox" and starts building a string of forts in the Champlain valley. At turn's end he shifts to Kahnawake to be better able to respond to the threat against Niagara. For the third turn in a row the main French army suffers through the "Pox" but is luckily reinforced with victorious troops from the battlefields of Germany. Montcalm shifts his forces to Quebec in case Wolfe lands. A large army under Amherst begins to advance up the Champlain valley from Albany. Both sides launch successful raids. VPs stand at FR4 at turn's end. The Brits continue to advance towards Niagara and Montreal while threatening Quebec from the sea. The three British armies each outnumber the main French army under Montcalm. The French send out small forces to threaten the supply lines of the advancing Brits. Montcalm builds a fort at Ile d'Orleans to protect Quebec and shifts back to Crown Point to oppose Amherst. The western British army under Bradstreet finally reaches Ft. Niagara, which will mean victory if he can take it. Fortunately for the French, however, Dumas has been able to slip behind Bradstreet and cut his supply line at Raystown, preventing a siege at Niagara. A French "Courier is Intercepted", though, and it is starting to look like the Brits will able to pull it out because of extra cards. But a British effort to drive off Dumas fails! Dumas' presence also threatens Alexandria and Baltimore forcing the Brits to waste time garrisoning both. With the offensive against Niagara stalled, the Brits shift their efforts to the east and land Wolfe at Ile d'Orleans. Montcalm shifts back to Quebec to join some recently arrived reinforcements, leaving the string of Champlain forts to protect Montreal. As Wolfe takes out the French fort at Ile d'Orleans, a small French force under Beaujeu crosses the Green Mountains and threatens Boston. The Brits are forced to waste one of their extra cards to protect it with a garrison. The game comes down to the Battle of Quebec, where Wolfe attacks Montcalm. In only the second major battle of the game the French are victorious, bringing their VP total up to 3. Both sides had launched successful raids. The Brits concede defeat. Much like last year's WBC final, the British player probably allowed great early cards to go to his head and just played too conservatively against a skilled French opponent. 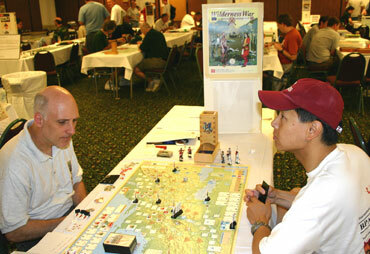 17 players vied for the WAM 2007 Warclub provided by GM Keith Wixson. 19 games were played in the four-round Swiss, and the last man standing was Peter Reese. Reese defeated Ron Fedin (2005 WBC Champ), James Pei (2004 WBC Champ), Paul Gaberson (2003 WBC Champ) and Bill Edwards in the Final. French dominance continued. The French won 13 games (68%) to the Brits' six. 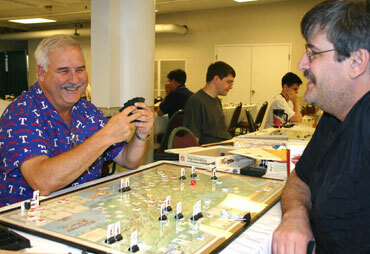 There was a bid of 1 VP to play the French in 14 games and a bid of 2 VPs to play the French in one game (a Brit win). The other four games (all French wins) had no bid at all. The average French score in their wins was 5.7 VPs. On the other hand, the British wins almost all came in later rounds by top players. The Champ was 2-0 as the Brits, and played them in the Final. Also earning WNW laurels were Keith Wixson, Paul Gaberson, Andy Maly and Ken Gutermuth who finished third through sixth respectively. Brits looked at their hand and concluded Janus the god of luck had annointed them. In their initial hand was the 3 Highlander, the 1 Highlander, a Brit Regular, a campaign card and an amphibious card. Was expecting a SHORT game. French started with drive to HCN and sieged it with their second card. Parliament had decided that North America was the critical theatre for 1757. The Brits played the regular card, got Amherst and sent him to New York with three Regulars, Then played the 1 Highlander card and sent Forbes to New York and the Highlander to Halifax. The French then started raiding. Card 3 the 4 x Highlander + Wolfe and Murray showed up in Halifax. With this play the French concluded Louisbourg was not a good place to be and evacuated it Wolfe and his mob then landed while Amherst took his mob to HCN. Wolfe too Louisbourg in two tries meanwhile the French started raiding with the first three tries successes (argh). Brits held over Vaudreill. Fortune continued to smile on the Brits. First Montcalm was sent to Ohio for another Amphibous card (which just arrived this turn - the French had the other two so were not worried about a landing) permitted Wolfe and everyone to land at the gates of Quebec. The French had immediately started moving Montcalm back and when Wolfe landed they used a campaign card to put Montcalm and the army (which moved from HCN) together around Montreal. Wolfe then moved to siege Quebec (which looked like a real winner as the Brits also had a fieldworks card). Then disaster occured when Janus the fickle god of chance showed his favor to the French when the French made their desperate attack v. Wolfe sieging Quebec the dice result was French 6 British 1. To add insult to injury Monckton (who covering Wolfe's bungled retreat) stuck his head up and was clipped with a musket ball. The Brits retreated one space less seven steps to five for the French. End of year the Brits went back to Albany, the French wintered in Quebec (they had destroyed the southern fort along the Lake Champlain route) and Wolfe slunk back with his forces to Alexandria (I could not stand another battle with Wolfe's force). The French raids pretty much used up their indians (Brits were up to two militia in the southern zone) but they did end up with three points for raids for 1757. French held over Quiberon which turned out to be a very good choice as Brits played surrender causing a reshuffle. Brits got last regular card, placed Bradstreet and three regulars in Alexandria along with Wolfe and Murray. French got a regular card placed them with Montcalm in Quebec. Montcalm deployed defensively to Winooski with his entire army (including a couple of French Marines (1-4s). Amherst with a gigantic pile of troops observed him from Albany (additionally provinicals had been added). Wolfe moved up to Allegheny South and built a fort. The French raided and picked up the marine detachments out west to avoid Wolfe. Wolfe then moved to Upper Monogahela where disaster truely struck. A lone indian at Mingo Town intercepted and in the skirmish both Wolfe and Bradstreet were killed leaving Murray in charge of a BIG army he could not command. Still he managed to haul troops to Ohio Forks and finish the fort. 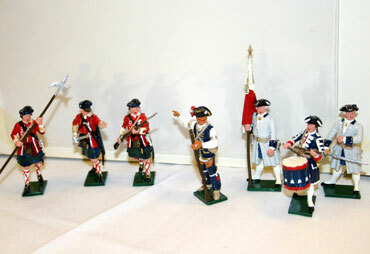 Meanwhile the French did minor adjustments and began forming up a force to defend Niagara. Then with two cards left (the Brits had Foul Weather and Bigot) the French made a fatal error (the joys of face to face play). Instead of moving Montcalm and his troops into winter quarters they spent a card to further adjust their forces out west (looking at the map they could see the Brits needed two cards to get everyone out west to winter quarters) so they had no worries. However the British exposure was only two or three steps and the French exposure was on the order of 10 steps (including three regulars permanently lost). So the penultimate Brit card was Bigot and the French army got to starve and freeze over the winter in Winooski. At that point the French conceded.